Few people realize that all living organisms on Earth possess awareness and appear to think and react to changes in the environment. The lowly bacterium is among them. This is the reason that the medical world has had such a problem with fighting against a growing problem of disease-resistant bacterium. Those little buggers can get fooled once when slaughtered by a chemical compound that is poison to them. But the message is passed around among the survivors and it is not long before the bacteria in the neighborhood finds a way to breed new and more powerful cousins that can survive the poison and still attack the host. Most of us understand that the reason bacteria has been able to develop this resistance to some of the popular antibiotics has been our own fault. Doctors believe people stop taking the medicine too soon, which allows some of the bacterium to escape the assault, thus carrying information about the poison to the neighborhood. Also agricultural misuse of antibiotics on livestock has been a factor in this breakdown of the medicine that used to fight infections. We keep getting low doses of these antibiotics daily in the food we eat. Unlike humans, the tiny bacteria do not take this information into laboratories where specialists work to create new genetic strains that can survive these chemical attacks. It just happens naturally over the course of several years. But it happens. And because the pharmaceutical companies have been slow in developing new forms of antibiotics to replace the old ones, people are starting to be overwhelmed by the new drug-resistant varieties of certain disease . . . especially forms of Streptococcus that seems to be living all over the place and especially in hospital facilities. This problem has had doctors worried in recent years as more and more cases of disease-resistant infections appear in specific areas. They knew that something had to be done to stop it. A study just published in the journal Proceedings of the National Academy of Sciences, says researchers at The Scripps Research Institute (TSRI) have managed to modify the powerful drug vancomycin to make it an almost indestructible antibiotic against even the toughest of so-called drug-resistant bugs. 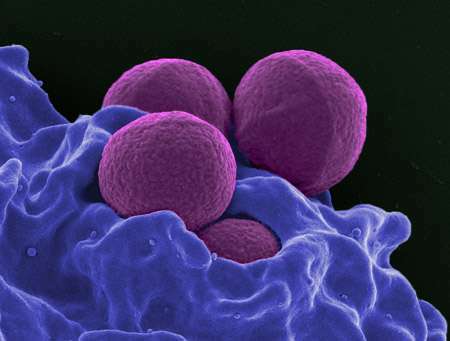 Basically the researchers have created a new and more powerful version of vancomycin, giving it a 1,000-fold increase in activity which attacks the bacteria cell walls in three different ways. Dale Boger, co-chairman of TSRI’s Department of Chemistry, who led the research, said the drug was tested on the drug resistant strains of the bacteria Enterococci with positive results. Boger said the new form of vancomycin works because “organisms just can’t simultaneously work to find a way around three independent mechanisms of action. Even if they found a solution to one of those, the organisms would still be killed by the other two. The drug is sold under the brand name Vancocin sold by Ani Pharmaceuticals in Minnesota.